The latter is especially important. Young people need to be fully engaged. Providing outlets to have fun and stay active helps students make the most of the time they spend volunteering. 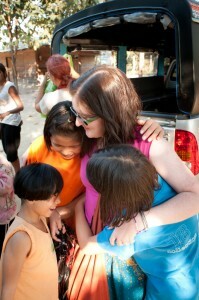 Thailand is an ideal place for young people to get involved in volunteer projects. This is a fast-developing nation with plenty of infrastructure, but there is still plenty of work that needs to be done on the ground. Accommodation is safe and secure; the people are warm and friendly; and local menus include everything from exotic curries to good old-fashioned hamburgers. But it’s not just the safety and convenience of traveling in Thailand that make this an ideal destination for teenage volunteers. The rate at which Thailand is developing means that many underprivileged people are neglected and overlooked. Students can cultivate a stronger sense of social awareness and their place in the world by lending a hand at orphanages, rural schools, elephant conservation parks and a host of other project sites. Friends for Asia’s volunteer programs are officially only open to participants aged 18 and over. While we don’t accept high-school-aged volunteers into our independent programs, we partner with organizations that do. We highly recommend Global Leadership Adventures (GLA), a US-based organization that specializes in service-oriented projects for groups of high school students. We collaborate closely with GLA to ensure that students can make a difference in Thailand and forge lifelong memories in the process.